The video streaming application PressPlay TV has partnered with Northwestern Railways to offer free Video-on-demand (VoD) service in Delhi-Bikaner and Delhi – Udaipur bound Delhi-Bikaner Intercity and Chetak Express. The service will soon be expanded to 30 more trains in the next quarter. This alliance means that the passengers will be able to stream the videos of their choice directly from the PressPlay Hotspots installed in AC coaches of the train, onto their smartphones or tablets without using their mobile data. 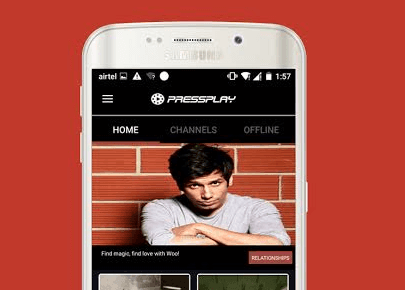 The PressPlay TV app automatically downloads when the phone is connected to the Wi-Fi & users can start streaming movies & videos at super-fast speeds for free. The downloaded video gets stored in the app permanently and the users can continue watching the downloaded movies even after they de-board the train. There are more than 30+ channels like Bollywood, comedy, sports, News, music & more. “It is our constant endeavor to provide a superior experience to our travelers through innovation and use of cutting edge technology. We have tied-up with a leading company like PressPlay to offer high quality and wholesome entertainment to the travelers on our railway. I am sure that Indians who want to explore the royal legacy of India and travel by trains to the Rajputana would be delighted by this new offering,” says C.R. Kumawat, Senior Divisional Commercial Manager, North Western Railways, Bikaner.